Sharing quotes online has become a regular activity of most people nowadays. This goes to show the undeniable power of quotes to motivate and inspire people. Equally worth highlighting is the fact that since most people habitually share them, this is a good sign that compassion is still very much alive even in these modern times. 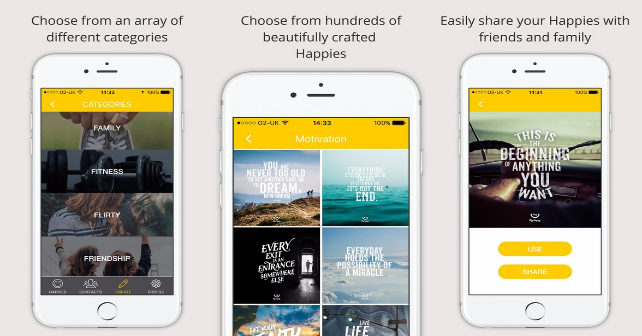 This all-in-one quote maker and messenger app by My Happy seeks to spread the love more by giving users all they’ll need in their quote-sharing endeavors. Inspirational Quote Maker and Instant Chat Messenger by My Happy is your number one resource for inspirational quotes of varying subjects. Whether you intend to send to your family or your gym buddies, know that every quote is arranged and separated into categories. What’s great is that its developers are proactive in adding categories on a consistent basis. Once you’ve chosen your quote (or Happies, as they are called in-app), you can then proceed to beautify it by changing its stock background images and colors, filters, photo effects, and fonts, to name a few. You can even use images that have already been stored in your device. What’s certain is that you can completely personalize your quotes and the end results are always share-worthy. The overall layout of the app makes choosing and designing quotes incredibly easy for the user. It also saves you a lot time instead of relying on third-party programs and apps just beautify your prospective quote. And the fact that you can share your creation with a single tap of the Share’ button only seals this app’s focus on user convenience without sacrificing style as evidenced by its very contemporary design. The other main feature of this app is its messenger. With it, you can add contacts and friends in a completely independent platform. Once done, you can no begin to send and receive your own creations and messages with each other. Much like any other social network, you can also edit your profile liberally. With its hybrid setup, this app is able to completely stand apart from other apps that center on quotes. The ability to modify and add designs to your quotes is also something that is completely original to this app. In the end, the ultimate value of this app lies in the convenience it gives users when sharing inspirational quotes online. It’s something that a lot of us include in our daily online activity, and this app serves to enrich and encourage this activity better with its responsive features.